What does Freya look like? 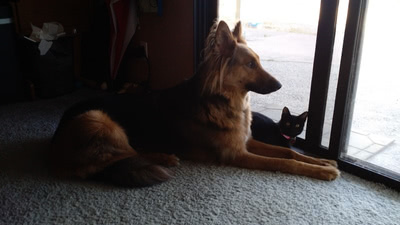 Freya is colored like a traditional German Shepherd, with deep tan (red) on her legs and head and a black saddle/blanket pattern on her back, but her muzzle is not as black as usual. She has a small white spot in the middle of her chest and a couple of white toe tips on her back right paw. Her fur is rather long, although not as long as Penny's (at least not yet). She has long fuzzies coming off of her tall, pointy ears and her tail is very thick and bushy. She also has a lot of feathering behind her front legs and rear thighs. While her color is classic GSD, her shape is... not. Her legs are too long and her muzzle is too long and pointy for a proper GSD, which, combined with the fluff, is why we call her a "Shepherd-Collie Mix". Her tail also seems to have a kink in it, as it always curls to the right. And she's missing a couple of teeth. When she came home, she had them, but it turned out they were puppy teeth and when they fell out, nothing replaced them. In 2018, after reading a review of DNA tests for dogs in The Whole Dog Journal, we got Freya tested to see if we could find out about her ancestry. 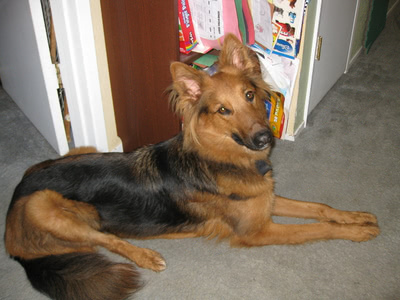 I laughed when we got the results back, because it said she was a... German Shepherd Collie Mix! 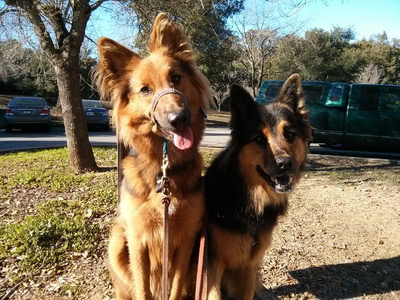 The actual results were ½ German Shepherd, ¼ Collie, and ¼ Unknown mix of groups including herding, wild canid, asian, and sporting (full results). Where did Freya come from? 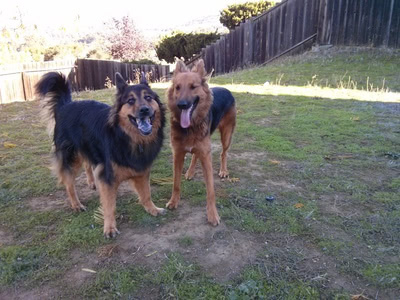 I knew someone from the Mixed Breed Dog Club of California who was also involved with German Shepherd rescue. 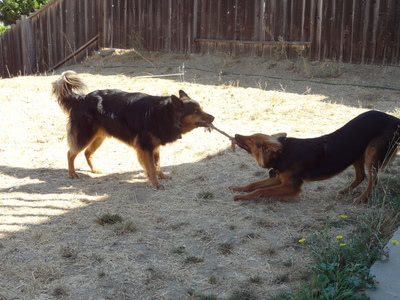 In April of 2014, she contacted me about a puppy she was fostering who she thought would get along great with Penny, since Penny can be quite a force to be reckoned with (she comes on strong in play). The foster mom told me this female puppy, who the rescue was calling "Penley", didn't seem to bother their female GSD, who usually took offense to other pushy "dominant" dogs. She thought that, plus the name, was a sign that she was meant for us. I took a trip out to visit her, and see if she might be a good fit for us, as well as Penny. I met her and we talked about her personality. She seemed like a pretty normal, rambunctious puppy. My friend told me about how she had already started to actually fetch balls that you threw for her and she was getting pretty good about pottying outside. She also said she was in the full puppy stage of teething and chewing on everything, including table and chair legs. I thought she seemed pretty nice, and asked if we could take a walk together so Penny could meet her and we could see if they might get along. Freya's foster mom took her across the street while I got Penny out of the van. When Penny hopped out, neither really reacted to the other, which I thought was a very good sign. Then we started walking down the street. We let them sniff the sniffs and each other as we went. They both did really well with each other. I was most worried about Penny, since she can come on so strong, but she was really good. We walked out for a ways, then walked back. Both puppers were really good the whole time. When we got back, I said I would take her, if the rescue group would let me. I also told my friend that I had a big rally trial with Penny the next weekend, and if possible, it would be best if I could pick her up after that (I didn't want a big life change to throw off Penny's rally game). She thought that would be ok, so Penny and I headed home. After the rally weekend, Penny and I went back to pick Freya up from her foster mom in early May. She and Penny still seemed to get along, although Penny did not like the idea of this upstart being in the crate right next to her, but I had come prepared with a large piece of cardboard that I slipped in between the crates. This seemed to satisfy Penny, so we headed home. I had been warned that Freya got car sick pretty badly, so she hadn't been given a big breakfast. My friend also noted that she'd been alerting to strange people and other things appearing suddenly, as she did when a lady came out of a building and walked to her car. But the trip home was uneventful, although I worried about car sickness. When we got home, I got Penny and Freya out of the van, then I had Dave bring Pablo out of the house and we went on a little walk around the neighborhood with the three of them. Freya didn't bat an eye when Pablo appeared out the door. We walked a ways, then went in the house and everything was good. Everything had gone so well with all the introductions - everybody seemed ok with each other. What's Freya like at home? Freya turned out to be quite a handful once she settled in. She did, indeed, try to chew on table and chair legs - and pretty much anything else she could get in her mouth. We had many damaged items, despite tethering and other close supervision. In addition to training time, I had to burn off her energy with a lot of ball play in the back yard, usually twice a day, morning and afternoon. Despite loving to play, she always seemed to tire quickly, which made it difficult to make sure she got enough exercise. But she did get really good at the two-ball game. Even after a good run, she did not settle easily once back in the house. She would pace, look out the sliding door, pace some more, chew on a toy, and pace some more. We got lots of different chewy bones, but they didn't captivate her for too long at a stretch - even the Himalayan chews. She did like Bully Sticks, but they didn't last very long before they were gone. I tried stuffed Kongs and other food toys, but her interest in actually working to get the food out was incredibly low. She was very perplexing! Now that she's a little more mature, she's better at settling most of the time, with the notable exception of the morning when we are trying to sleep in a little. Freya has been really good in some areas, and really challenging in others. She has always been super good with Penny, always deferring to Penny's assertive ways. She has been great with my daughter, too. Of course, she can be rambunctious, jumping up and whatnot, but she has never shown an iota of resource guarding towards any human, even the kiddo. This is in contrast to Penny, who has always had that resource guarding tendency in there. We always had to be extra careful with Penny and the kiddo for this reason, so it was a relief that Freya didn't exhibit this. My daughter can also take Freya by the collar and get her to go in her crate, for instance, and that has never been a problem either. Speaking of crates, Freya has always been really good about going into and being in her crate, even when it is in the dreaded car. Once she's in, she settles down nicely without any complaining or worrying about being alone. She didn't take long to adjust to the cats, either. 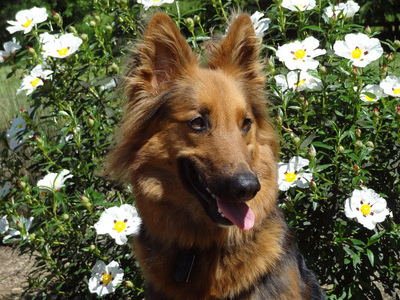 Of course, if they run, she will chase after them, but she is very good with them and otherwise fairly respectful. 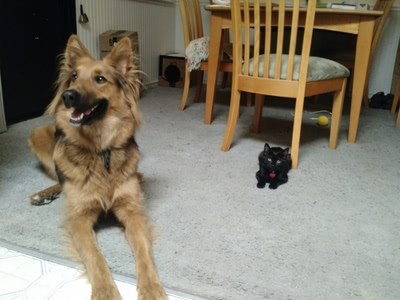 She and Hairy Pawter have become pretty good friends, too. Freya has also been very appropriate with other strange dogs she has managed to meet - both big and small. Managing to meet strange dogs has been no small feat. Within a couple days of coming home with us, Freya showed she had an extremely dog-reactive side. Like, there's a dog waaaayyyyy over there, so I need to bark at it! This has been her biggest challenge, by far. It's made doing everything so difficult - from fun stuff like going for walks or hikes to necessary things like going to the vet. Anywhere there is the potential for strange dogs is Not A Fun situation to be in. And when she first came home, she would also react to many strange people, like a person in a big hat who came around a corner, the person sweeping the sidewalk, or the person carrying a boogie board. She has gotten tons better about strange people she sees when we're out and about, and now rarely reacts to people at all any more. But dogs continue to plague us. I even had to teach her to wear a Gentle Leader head collar because even with a no-pull harness, she would continue to stare, bark, and lunge as I tried to move her away (I know no reaction is the best, but in the beginning there didn't seem to be a distance far enough that wouldn't get at least intense staring, if not more). I have worked on it extensively, and any time I see a strange dog in the distance, I try to work on her reaction. I try to reward her for looking calmly, looking back at me, or looking and dismissing (the best reaction, if we manage to get it). If she starts to amp up, because the other dog came too close or started staring, barking, etc., we move away and I try to get her to search for cookies sprinkled on the ground, which doesn't always work. We've gone to places where dogs frequent intentionally to try to work on it, moving off the path when we see a dog coming and watching as they pass. I've also taken Freya to the dog park, where we hang out far away outside and try to watch other dogs running, which is extremely difficult. She has gotten a little better. Now, instead of erupting in a frenzy of mad barking, she tends to whine more and if she barks they are more higher pitched "yips" - more excited than strictly fearful. But there is still sometimes some growling and "yodeling" - something between a whine and a growl. When she has met a dog, she has always been extremely appropriate with them and remembers they are ok, so I've often wished she could just meet every dog in the world and then she would be happy. 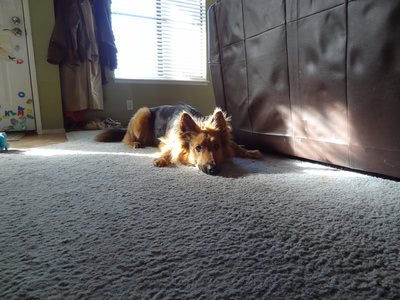 In addition to the dog reactivity, which is by far her biggest challenge, Freya also has a number of other problem areas. Her car sickness as a puppy has made her really hate going places in the car. She likes getting to the places, she just really hates the trip, especially the getting into the car part. She also does not like putting on a harness, even though she has been doing it pretty much since she came home. There is something about putting it over her head that she does not like. I've tried to work on it with her, by shaping her to stick her head through, but it hasn't helped much. She works very hard to avoid the harness. I'm not sure why, but I wonder if it has to do with remembering the dog catcher's loop thing. Freya doesn't do well when people come over to our house. If people ring the doorbell, Penny will bark like a nutter, but then when they come in she will give them a sniff and a waggy tail and be on her way. But Freya will continue to worry about them after they have come in. We usually just put her in her crate (or an x-pen if it's a longer period of time), but if we leave the bedroom door open, any time somebody walks by, she will start barking again - loudly. It happened even if she was gated loose in the room (but we had to stop doing that when she started destroying things in there, including the gate). I already mentioned her inability to settle. This was most annoying in the evening, when we had plopped down to relax and watch some TV. 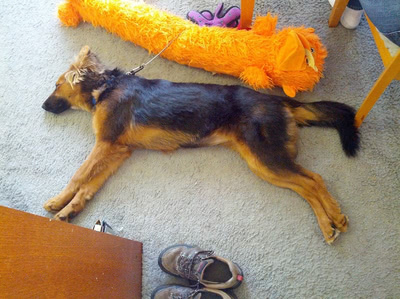 After she had already run around in the back yard and then done some training to tire her body and brain, she would just pace around and around the living room. I couldn't get her to just settle down and chew a chew toy, for instance. She just seemed like she could not relax. But, almost like an over-tired child, if you just put her in her crate, she would promptly calm down and go to sleep. It was so perplexing! Freya also doesn't act like a normal dog when she greets you. Any other dog will lick your face if you kneel down and pet them. But Freya does not lick. She will rub nose juice all over you, but she won't lick you. Not your face, not your hands - nothing. But she does like to paw you, like on your face. I've never had a dog behave like her before - she is just so confusing. Of course, I started clicker training Freya the day I brought her home. I think I started with perch behavior, which she picked up within a couple of sessions. I also (for science) decided to try a little more luring at first to "get the behavior" and decrease frustration. Penny had a really hard time with shaping moving her rear feet both directions around the perch, so I wanted to make it easier for Freya by using treats to start with. It did seem to help, as she quickly picked up moving both directions around the perch with just a hand signal. We also worked on other "normal" doggie stuff, like Sit, Down, Come, etc. She became really good at shaping. She would pick up the behavior very quickly in most cases. But it turns out Freya is rather bad at attaching verbal cues to behaviors. She has always had the hardest time differentiating verbal cues. It felt like it took 10 million repetitions of "Sit" and "Down" before she responded reliable to either. I don't remember Pablo or Penny having so much difficulty with learning cues. And Freya has had a really hard time learning to respond promptly to cues, like stopping and downing when cued to do so while coming toward me. It's like her brain couldn't switch gears to do a new cue while she was executing an old cue or pattern (like chasing cookies back and forth). We had to work on this quite a bit, and really break down the stopping forward motion from executing the new cue, for instance. Despite those challenges, Freya has managed to learn a number of behaviors. We've been working on a lot of tricks lately, since I'd like to go for some trick titles soon. Here is Freya's list of tricks. Some of them are still works in progress, but we've at least started on them. Pictures will be coming eventually! When I brought Freya home, I had aspirations of competing with her in obedience and rally, as I had done with Pablo and Penny. But those plans were quickly dashed when the extent of her dog reactivity became apparent. I had more or less given up on doing any sports with her except for nose work (where reactive dogs are accommodated) when I learned about the new and growing area of online video titling for dogs. While I have absolutely no interest in musical freestyle, I learned about Rally FrEe, which is basically rally where the dog can heel on either side and even in front and behind, plus you can do some tricks and other things on the course. It is scored and precision is emphasized, which is what I like about regular rally and obedience. So I decided to start training for that. But Rally FrEe also emphasizes verbal cues only, so we have been slowly plodding along with Freya learning the plethora of verbal cues required, since verbal cues are not her strong suit. We may be ready to try some of the skills tests soon, since those are one cue at a time, and we get to choose them. 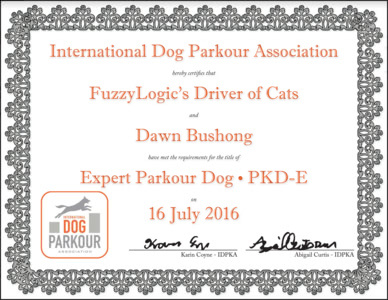 Then my training buddy Carol told me about Parkour for dogs. After looking it up and reading about the requirements, I was sold. Freya has always been naturally very agile - almost cat-like - so this sounded perfect for her. We started practicing while out and about, then filming when I found obstacles that met the requirements. Penny also got to play at the Novice level, but I didn't feel that her old joints would be up to the rigors of Intermediate and up, so she stopped there. 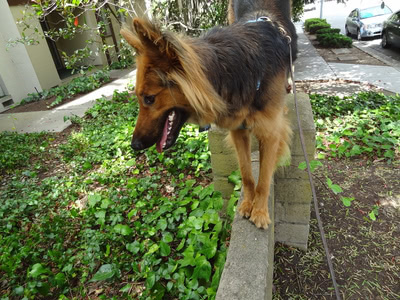 But Freya went all the way to Expert - only the second dog to earn that title with the International Dog Parkour Association. The hardest part of that was finding obstacles that fit the requirements! 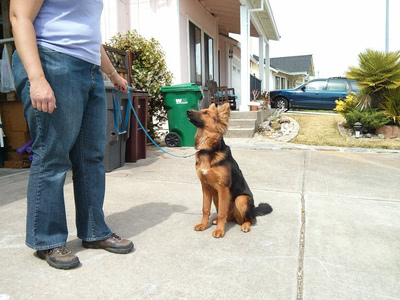 I was so happy that I had found something Freya and I could do together, besides just work on dog reactivity and train at home. 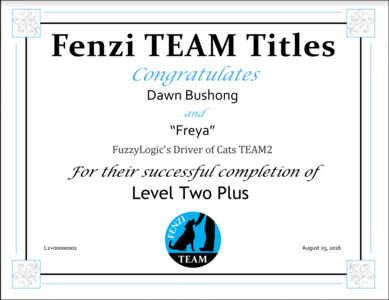 While we were working on Parkour stuff, I learned about the new Fenzi TEAM title program and Non-Competitive Obedience, both obedience-focused titling opportunities which, while not scored, were something else Freya and I could do together. We started in on Fenzi TEAM, which allowed you to video at home and in other quiet locations in the beginning levels. There are six levels, and Freya (and Penny) have recently gotten to Level 4, and now we're working on learning the skills for Level 5. I'm so glad to have found these video titling opportunities so Ms. Dog Reactive Freya and I can have goals to work towards! All along, Freya has been learning nose work, and has been practicing hides with Penny for quite a while. She seems to be quite adept at sniffing games, having an easier time than Penny on certain kinds of hides (very elevated, for instance). Nose work class has been great for her, as there are regular dogs to get used to, and also new dogs that come in every so often. Plus the people willing to give her treats in the parking lot while we're waiting our turn have greatly helped her to learn to be more comfortable with strangers. She passed her ORTs for all three odors (birch, anise, and clove) in November of 2015, then nearly a year later I thought she might be ready to try a trial situation (with all the strange dogs). Some parts were rough (specifically, the parking lot), but she managed to get to the search areas and actually do some searching, earning her NW1 title. Here are some of Freya's title and other certificates. I'll put more up when I find and scan them. Does Freya have any aliases? Freya mostly goes by "Bob" or "Frey-Bob". I think this started when Dave called her "Frey-Bob" one time when she was acting like a dingbat, and it sort of stuck. So a lot of her nicknames are derived from that. She also gets called Bobs, Bobsie, Bobbie, Bobbie Sox, Bobzilla, Boberta, and Dingus. Why would you run up to the big, scary spider? I am not fond of spiders. I don't know why, but they are creepy and scary and I just don't want to be near them. I would never, in a million years, see a spider in the distance and feel compelled to run up to it just to see what it might do. Freya is uncomfortable with strangers. I don't know why, but she thinks they may try to eat her or something at any moment. And yet, she does feel compelled to run up to the scary people. She is attracted to what she is afraid of. I don't understand it, but I only let her meet people I know, and who either already have cookies or who I've given some cookies to give her. Then, at least, she gets cookies from the strange scary people, and has even learned that eye contact with strange, scary people is not a bad thing, but results in more cookies. Then I give her even more cookies for choosing to leave the strange people. It's like, once she's there, she doesn't realize she has the option to leave. Have I mentioned that she is a very perplexing dog?